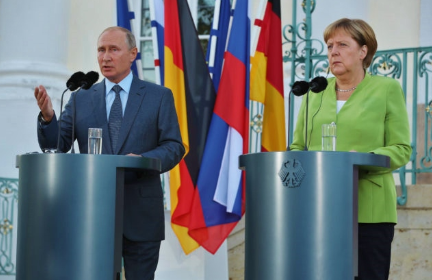 The war in Ukraine’s east was the topic that Merkel placed at the top of her remarks at the August 18 Berlin-Meseberg meeting with Putin (see Part One). Putin relegated this topic to the end of his remarks, as if to confirm Russia’s current tactic of feigning disinterest and playing for time. Nevertheless, in what seems to have been a prior arrangement, both leaders stopped short of even alluding to the matter of economic sanctions in their public remarks (Bundeskanzlerin.de, Kremlin.ru, August 18, 19). The European Union introduced and periodically prolongs the sanctions on Russia with Merkel’s decisive support. However, the lifting of sanctions is made conditional on the fulfillment of the Minsk “agreements” by both Russia and Ukraine, instead of registering the fact of Russia’s aggression in Donbas and conditioning the removal of sanctions on the cessation of that aggression. Both leaders reconfirmed, as usual, the “indispensability” or “irreplaceability” of the Minsk “agreements” and negotiations in the Normandy Group (Ukraine, Russia, Germany, France) and the Minsk Contact Group (Ukraine, Russia, Organization for Security and Cooperation in Europe), albeit from different standpoints. Putin does so because that setup (whether “successful” by Moscow’s criteria, or otherwise paralyzed by Moscow as it currently is) works in Russia’s favor in Donbas. For its part, German diplomacy professes allegiance to Minsk and Normandy because it is trapped in that setup, of which it is a co-author and could not come up with more creative ideas of its own. While Merkel pleaded for a stable ceasefire, or at least a ceasefire timed to the start of the school year in Donbas, Putin did not mention the desideratum of a ceasefire in his remarks. Low-intensity but unabated warfare with threats of escalation is Moscow’s pressure tool on Ukraine as well as on the Normandy negotiators (Bundeskanzlerin.de, Kremlin.ru, August 18, 19). Putin’s Berlin performance also presages a continuation of stonewalling by his assistant, Vladislav Surkov, in the informal consultations with the US State Department’s special envoy, Kurt Volker, about the proposed UN-led peacekeeping mission. Surkov has been feigning disinterest in, or disengagement from, those consultations since January of this year. For his part, Russia’s Foreign Minister Sergei Lavrov has ruled out any ministerial-level meetings in the Normandy format in the foreseeable future, citing the assassination of “Donetsk republic” leader Aleksandr Zakharchenko as an alibi (Interfax, September 1). Zakharchenko, however, did not participate in any negotiations and had no decision-making role in this regard. As she did with regard to Ukraine, Merkel also offered to work with Russia on a “peace order” in Syria at her joint press conference with Putin in Meseberg. Bowing to the facts on the ground, Berlin no longer links a political solution with the removal or departure of the Kremlin-backed Syrian President Bashar al-Assad from power. This shift in Berlin’s position can be traced to Merkel’s meeting with Putin in Sochi in May (Bundeskanzlerin.de, Kremlin.ru, May 18), when the chancellor implicitly accepted a negotiated solution with al-Assad’s participation. In Meseberg, Merkel confirmed, “As we already said in Sochi, the priority [in Syria] is, before anything else, getting started on a political process, constitutional reform, and possible elections” (Bundeskanzlerin.de, Kremlin.ru, August 18, 19). Germany fears that a continuation of fighting in Syria (and Turkey’s overcongestion with refugees from that war) would continue generating migration to Europe, where Germany is the destination of choice. Destabilizing Germany’s political system and society, mass migration has become the most sensitive political issue in the country. Merkel and many other German politicians are keen to demonstrate a start to a process of repatriating migrants, at least symbolically in small numbers; but they cannot do this until the areas of those refugees’ provenance are stabilized and designated as safe. A start to repatriation is a short- to medium-term goal, however. In the immediate term, Berlin fears that a Russian-backed assault by Syrian government forces on Idlib (the major remaining opposition stronghold) could result in another exodus of war refugees. Berlin is therefore urging Moscow to prevent an escalation by acting as a “moderating influence” on Damascus (Bundeskanzlerin.de, August 27). Such a demarche implicitly accepts the Kremlin as arbiter in the theater, potentially crediting it with moderation, and petitioning it to exert its influence in line with such hopes, all while awarding it leverage. Exploiting the German vulnerability on this front, Putin asked Germany in Meseberg to support Syria’s post-conflict reconstruction, so as to make possible the repatriation of “millions” of refugees from Turkey, Jordan, Lebanon, as well as from Western Europe back to Syria. In the name of stabilizing that country, Putin asked in Meseberg for German inputs into rebuilding basic infrastructure, electricity, water supply and communal services in Syria. Overall, Moscow takes the position that international assistance to Syria’s postwar reconstruction is a prerequisite to the return of Syrian refugees to that country—one in which Moscow now holds a major stake. Merkel and Putin have agreed to create an expert-level working group of four countries—Russia, Germany, France, Turkey—to deal with migration, reconstruction, and related problems posed by Syria, bypassing the United States. The Kremlin wants to upgrade the level of this expert group, and suggests holding a high-level meeting in this quadripartite format (Deutsche Welle, August 18). Germany is already a member of the “small group” on Syria, a format initiated by France that also includes the United Kingdom, Germany, the US, Saudi Arabia and Jordan. Moreover, Germany intends—as Merkel told Putin in Meseberg—to take up its share of responsibility on Syria when Berlin joins the UN Security Council as a nonpermanent member for the 2019–2020 period. The meeting of Putin and Merkel in Sochi in May (see above) triggered a flurry of bilateral German-Russian high-level meetings. That same month, Economics Minister Peter Altmeier (a Merkel confidant—see Part One) and Foreign Affairs Minister Heiko Maas (Social-Democrat) held talks with their Russian counterparts in Moscow. In June, a Bundestag delegation conferred in St. Petersburg with Russian Duma members, who proposed creating a high-level Russian-German inter-parliamentary commission. On July 24, Merkel and Maas conferred in Berlin with Russia’s Foreign Minister Lavrov and General Valery Gerasimov, the chief of the General Staff of the Russian Armed Forces. Syria was the foremost topic in that meeting, but “they also addressed the conflict in eastern Ukraine” (Bundeskanzlerin.de, July 24). Upcoming actions this autumn include the St. Petersburg Dialogues and the Potsdam Encounters, annual high-level political events sponsored by economic interests via the Germany-Russia Forum. Berlin’s search for a rapprochement with Moscow is still in a tentative, exploratory stage. A German strategic design can hardly be discerned behind it. However, Germany’s preexisting strategic dependence on Russian oil and natural gas supplies can lend further impetus to an incipient political rapprochement—particularly one as improvised as this one seems to be. The German government attempts this rapprochement from weak internal political positions, following painful electoral setbacks and “left-right” polarization, all exacerbated by migration-related clashes for the first time in this country’s history. Berlin seems to act as if “needing Russia” in reaching out to Moscow (see Part One). Still, Merkel’s government holds firmly to the European Union’s economic sanctions on Russia, and it plays a key role in ensuring that sanctions are prolonged while Russia’s military intervention in Ukraine continues. At the same time, Berlin’s outreach to Moscow is a national sovereign policy, not one coordinated with the EU. The EU no longer has a coordinated policy (let alone a common policy) toward Russia, except on the Ukraine-related economic sanctions. Energy market legislation, centered on the EU’s Third Package, could have (and can still) form the basis for a common European external energy policy in relation to Russia, but Berlin is instead acting bilaterally with Moscow in this area. For its part, Moscow seems prepared to respond by restoring Berlin to its earlier status in Russian foreign policy, that of a privileged European interlocutor.